Many East Siders know the Hess family name from the story of the Hess Cooperage, honored with a landmark plaque at its site in Schenk’s Corners and subject of presentations by cousins Gary and Jim Hess. A 1947 photo of the barrel-making Hess brothers Joe, Eddie, Foots (Frank Jr.), and Tony (the generation preceding Gary and Jim) with their father Frank Sr. adorned the cover of the East Side Album, published by this club in 2008. 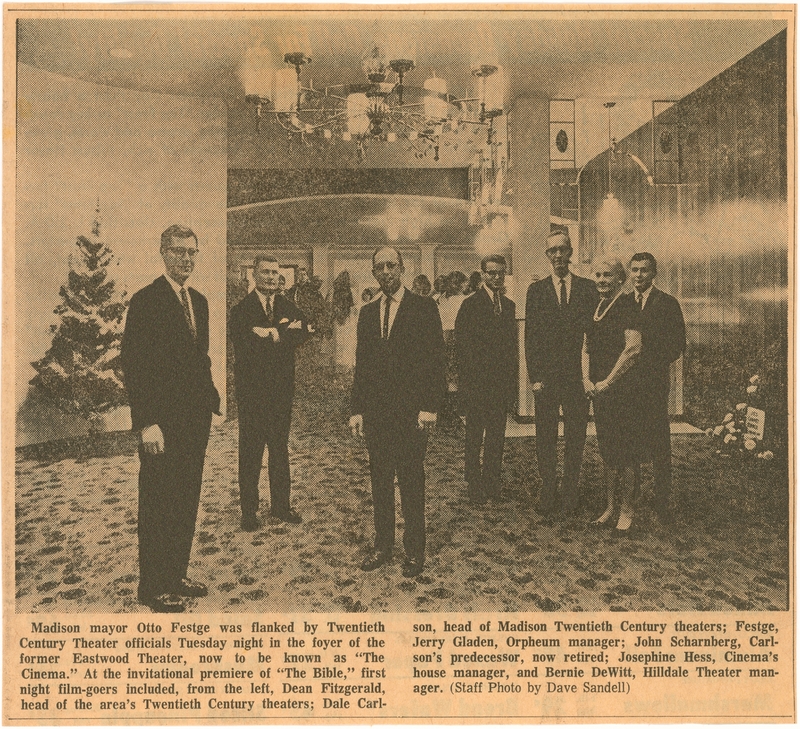 Gary sent us this clipping from the Dec. 20, 1967 issue of The Capital Times of his aunt Josephine Hess, the movie theater’s house manager, with Mayor Otto Festge and others on the occasion of the reopening of the remodeled Eastwood Theater, renamed The Cinema. In 1987 the Barrymore Theater replaced the Cinema with a venue for live music. Josephine would probably have been pleased. 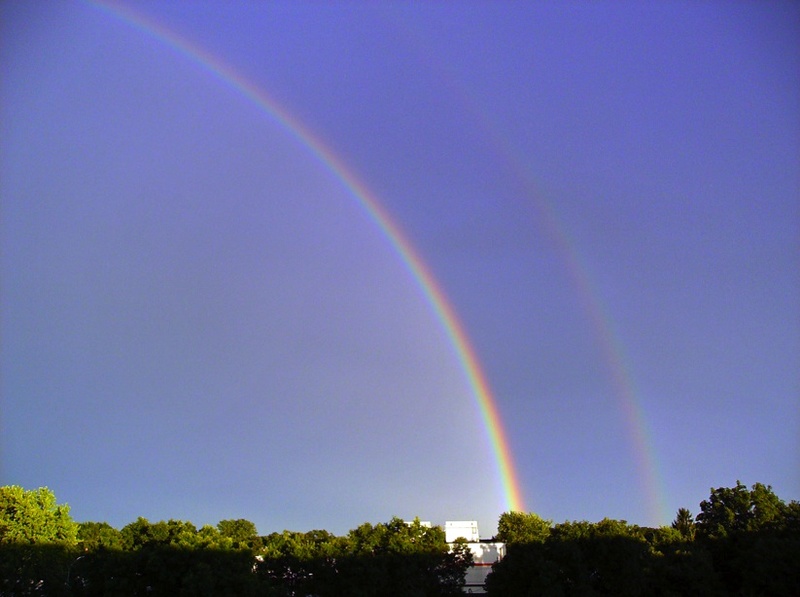 Here is a photo they took–note the double rainbow, and the spot-on landing right in the ice cream production plant. Now that’s a “pot o’ gold”! One of my favorite parts of John’s presentation was his child’s-eye view of the ice cream business (he’s a member of the third generation in this family-owned business). John described working in the plant over the change of shifts–which coincided with after-school for young family members–from the age of 8 or 9. His father’s generation did the same. Responding from another childs’-eye view was an audience member who told of sneaking into the ice cream trucks (frequently left unlocked overnight) to swipe tasty ice cream under cover of darkness. Every neighborhood needs an ice cream factory! 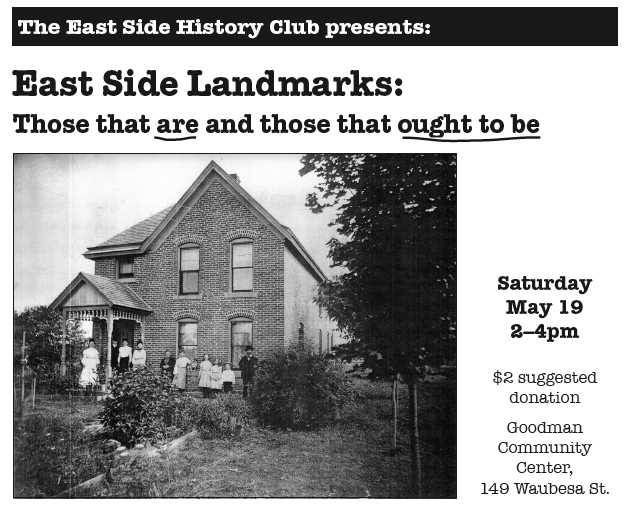 Local historian Ann Waidelich speaks about the East Side’s landmarks—the buildings that currently have Madison Landmark status and those that ought to be landmarks. Ann Waidelich will also discuss the city’s landmark ordinance—what it takes for a building to become a landmark, and how to go about nominating a building or house.